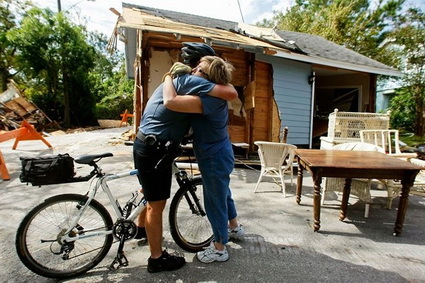 Recovery efforts from Hurricane Ike continue in Texas in the wake of the devastating storm. The death toll in the state stands at 17 however tens of thousands of people chose not to evacuate and officials are concerned the actual toll is much greater than that. It could take years for a full accounting of the missing to happen as it is thought that some that stayed behind and chose to ride the storm out were simply washed away into the Gulf of Mexico. 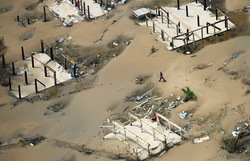 Search and rescue personnel have completed a search for survivors and the Red Cross is now performing welfare checks on people named by relatives. An estimated 90,000 people stayed behind and accounting for them will be virtually impossible. The death toll will of course not climb to that high of a number but it is expected that at least some of that number will never be accounted for. In the coastal town of Crystal Beach, the stench of rotting animals and livestock permeated the air where dozens stayed behind. One account told of a survivor seeing a friend pulled out to see when she couldn’t hold onto the rafters of a home. This entry was posted on Thursday, September 18th, 2008 at 7:24am MDT and is filed under National Weather. You can follow any responses to this entry through the RSS 2.0 feed. You can skip to the end and leave a response. Pinging is currently not allowed. These events are truly tragic and the image you posted just tugs at the heart. Our thoughts and prayers are with everyone affected by these storms. Miranda Lambert and Blake Shelton at the 2014 Academy Of Country Music Awards on the MGM Grand Lodge & On line casino in Las Vegas, Nevada on April 6.